Google have created an solution that could change the way AdWords targets its audiences in the form of IF Functions. Imagine you could tailor your ads to your audience based on certain conditions giving you more power to target and convert even more leads and sales. IF statements could be the answer, let’s explore. IF functions give the advertiser the ability to tailor ad copy dependent on device or audience; this will ensure you always deliver a relevant advert for the viewer. For example, if you are using a touch screen the advert will state “touch here” while on a desktop computer the ad will state “click here”. By changing your messaging to reflect an easier, mobile-specific CTA, you can generate more leads and sales out of previously low-performing mobile audiences. If you have used Ad Customizers, you will be aware of the guidelines principles behind IF functions. By inserting a parameter into your ad, you can have altering copy to reflect the conditions outlined within the parameter above. When using IF functions, there is a fall-back, so should something go wrong with the IF function it will revert to the unmodified ad version. This is great as there is no need to create another ad without the IF function in the same ad group. IF functions are easier to work with compared to other ad customizers as they don’t rely on feeds and solely work with the conditions you create within the braces. The AdWords UI will auto-populate the syntax when targeting by device, if you require “audience.” as the dimension you will need to rewrite the parameter and insert the name of the corresponding list as it shows in the account. (These are found in Shared>Audience tab). The biggest difference between “audience” and “device” IF functions are the inclusion of the “IN” field, which tells AdWords which audience lists you’re referencing. IF functions are a powerful tool for any business wanting to tailor their PPC AdWords Ad marketing. 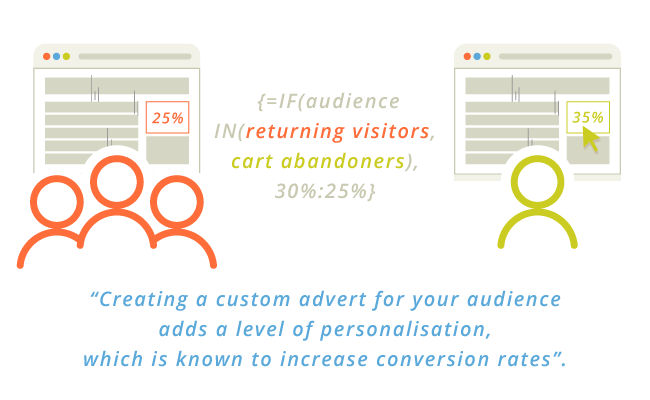 Creating a custom advert for your audience adds a level of personalisation, which is known to increase conversion rates. 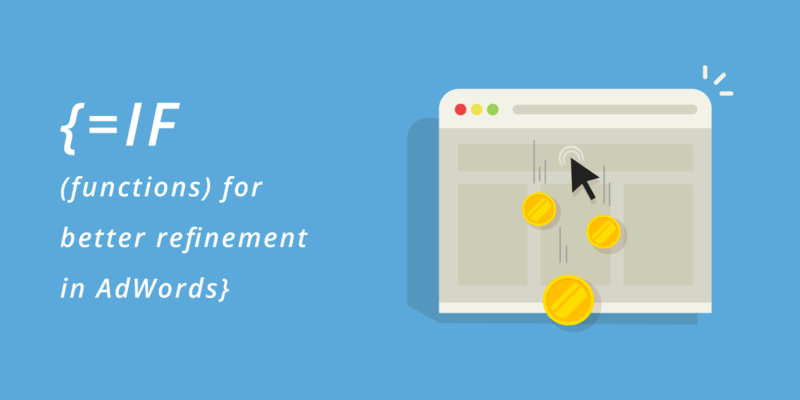 This is also an incredible way to use remarketing to great effect as you will be able to market to cart abandoners (people who come to your site, fill a cart, and leave before completing their purchase) if you have an eCommerce site. Using this tool, you will be able to offer discounts and incentives to bring prospects across the conversion line. Looking to improve your AdWords PPC performance our qualified PPC team can help. We have over ten years’ experience in creating and improving PPC campaigns both in the UK and internationally. Take a look at our PPC management case studies alternatively, you could give us a call on 01227 68 68 98.